As a global supply chain management company for metal products, we offer a comprehensive spectrum of products through the process of sand casting. Sand casting is particularly well-suited for the production of wide variety of metal components and complex forms. These parts can vary greatly in size and weight, ranging from a couple of ounces to several tons. It is the simplest production method but has many advantages particularly for: short-run or complex castings with multiple cores and core assemblies, larger castings, low tooling and equipment cost, and short lead time possibilities. In addition, sand casting plays a significant role in developing and testing sample products to be produced in high pressure die casting. As a matter of policy, our domestic and global manufacturing partners always ensure maximum process safety, cost-effectiveness and consistent high quality production. Due to our extensive experience in managing turnkey offshore sand castings manufactured in China, our customers enjoy the cost saving labor benefits, along with the piece of mind knowing that G&W Foundry will coordinate, execute, supervise, and expedite the production to meet the product specifications as provided by the customer. Some smaller sand cast parts include components as gears, pulleys, crankshafts, connecting rods, and propellers. Larger applications include housings for large equipment and heavy machine bases. Sand casting is also common in producing automobile components, such as engine blocks, engine manifolds, cylinder heads, and transmission cases. Sample and pilot run will be given 100% inspection during production and before shipment. A sample check for mass production according to ISDO standard or customer requirements will be verified. 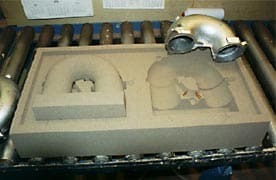 Contact G&W Foundry for your next sand casting production project. When you choose our company, you are guaranteed to work with a Global leader in the industry. We will give you expert advice, and work with you to determine what is best for you.